Beverly's Official Blog | News and findings from world of crafts, scrapbooking and more: Just In ..... New Yarn! Just In ..... New Yarn! We know, we know.... it's July, the sun is shining, and wool is not on our minds. But perhaps it should be. Homemade gifts are never out of season, and the holidays are just around the corner, so it's a perfect time for some new yarn. Check out this 100% wool yarn from Lion Brand Yarn. 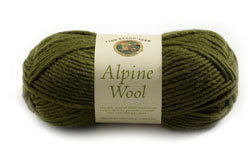 Alpine Wool yarn is a natural 100% wool roving yarn that's ideal for garments, accessories and felting projects! In a simple alpine wool yarn I know it can create lots of useful thing!